PETALING JAYA: The tender for the re-development of the 926ha out of the 1,215ha Rubber Research Institute (RRI) Malaysia land in Sungai Buloh, that is now controlled by Kwasa Land Sdn Bhd, is expected to be called by the third or fourth quarter of this year, sources said. The new developments would give the RRI land a huge physical and economic boost that would lift the land value of the area. Sources said the Employees Provident Fund (EPF) was now working on the master plan for the 926ha site so that it would be able to call for tenders for some parcels of the land as the entire development was supposed to take place over a 10 to 15-year period. Sources said the parcels were likely to be broken down to between 100 acres and 500 acres and as the RRI land had attracted massive interest, sources believed the tenders were something property developers were waiting for. The tenders were supposed to be out by June but because this development required considerable scrutiny and strategising, it might take a little longer. Besides the development led by Kwasa, the original owner of the land, RRI, would remain at the same location. It will get a new hub and under the agreement with Kwasa, RRI will retain 216ha. It intends to build the most modern research facilities including a museum, a commodity college, its headquarters and business clusters. This will be funded by RRI from the proceeds of monetisation of the 1,215 ha that it had once owned. In an interview with StarBiz, Malaysian Rubber Board (MRB) Director-General Datuk Dr Salmiah Ahmad declined to disclose the amount it would be getting for monetising the 1,215ha to Kwasa. She also declined to reveal how much it would cost MRB to develop the new facilities. “The proceeds will be given in different portions (over a period of time). “In addition to this, the Government will continue to fund MRB for its management and operations,” she said. RRI is one of the three agencies that come under the purview of MRB. She also could not say when the first portion of funds will be disbursed by Kwasa to MRB. However, she indicated that MRB must submit its master plan for development of the 216ha by this year to the Government. She said EPF would pay for the land but the pension fund would be able to recoup much of this when it tenders out the remaining 926ha, or 76% of the 1,215ha. 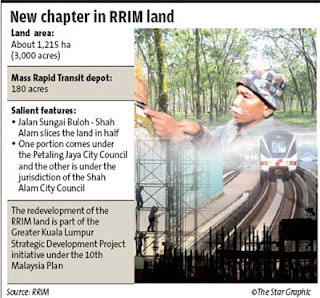 Of the total land bank, 73ha was allocated for MRT Co to build the Sungai Buloh MRT depot. That portion of land is being cleared by the company currently for development. The Sungai Buloh land is divided by the Jalan Sungai Buloh-Shah Alam highway which slices the 216ha in the middle. The northern portion is under the authority of the Shah Alam City Council. It houses the RRIM research station and the MRT depot. The southern portion comes under the Petaling Jaya City Council. Townships around the area include Kg Baru Sungai Buloh, Kg Sungai Kedondong, Taman Subang Bestari, Tropicana Golf and Country Resort and Damansara Indah. Salmiah said MRB would also be monetising other land bank where its facilities were located. This included Menara Getah Asli which fronts the Petronas Twin Towers in Jalan Ampang, the RRI building in Jalan Ampang, and two others, one each in Jalan Stonor and Jalan Lidcol. “MRB is blessed with some very strategic properties. “(But) anything we need to do with these properties would be decided by the board and has to be approved by the Plantation Industries and Commodities Ministry. We also need to consult the Finance Ministry. It is really up to board to decide what it wishes to do with these assets and when it wants to do it. “Our core activity is research and while we want to realise the value of our assets, (we have to do it systematically). We have to building our new premises before we can move out from our present offices that are located all over the Klang Valley,” she said. She added that whatever the plans might be for the 926ha was not going to affect MRB, however, being on that site itself, the MRB would have to be kept in the loop, especially those near the 216ha.